If you’re interested in a full year learning opportunity in natural building, home heat (ovens, rocket-stoves, and masonry heaters), traditional green woodwork, basic blacksmithing, tool-making, gardening, compost toilets, livestock (maybe) and more. 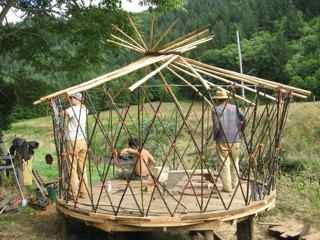 Directed by Kiko Denzer (affiliated with the North American School of Natural Building, Aprovecho Institute, Primitives Skills communities, etc.) Labor for rent trade includes possibilities for long-term collaboration. Requires basic skills/experience and transportation. For the year-long opportunity, get in touch with Kiko via the contact page. Since building a few working oven models I have worked hard in developing a working mobile oven. I’d like to share information and learn from you. just happenedon this site when doing research for my retirement and move back to basics. want to learn all I can about building my own earthhome and getting as green as possible. Hoping this sharing site will help. Thanks! Aloha- we live in Siletz. My husband bought me your book and I have read through it once and now im on my second read thru. I have been dreaming of my oven for a few years. We have other friends who I have gotten excited. So on this sunny spring day the dreaming is again beginning. Im thinking about having a work/build party. Wanna come? (I was wondering if you do small groups for small fees). Enjoy this day!!! !